Not to be confused with nu metal. Mu-metal is a nickel–iron soft ferromagnetic alloy with very high permeability, which is used for shielding sensitive electronic equipment against static or low-frequency magnetic fields. It has several compositions. One such composition is approximately 77% nickel, 16% iron, 5% copper, and 2% chromium or molybdenum. More recently, mu-metal is considered to be ASTM A753 Alloy 4 and is composed of approximately 80% nickel, 5% molybdenum, small amounts of various other elements such as silicon, and the remaining 12 to 15% iron. The name came from the Greek letter mu (μ) which represents permeability in physics and engineering formulae. A number of different proprietary formulations of the alloy are sold under trade names such as MuMETAL, Mumetall, and Mumetal2. Mu-metal typically has relative permeability values of 80,000–100,000 compared to several thousand for ordinary steel. It is a "soft" ferromagnetic material; it has low magnetic anisotropy and magnetostriction, giving it a low coercivity so that it saturates at low magnetic fields. This gives it low hysteresis losses when used in AC magnetic circuits. Other high-permeability nickel–iron alloys such as permalloy have similar magnetic properties; mu-metal's advantage is that it is more ductile, malleable and workable, allowing it to be easily formed into the thin sheets needed for magnetic shields. Mu-metal objects require heat treatment after they are in final form—annealing in a magnetic field in hydrogen atmosphere, which increases the magnetic permeability about 40 times. The annealing alters the material's crystal structure, aligning the grains and removing some impurities, especially carbon, which obstruct the free motion of the magnetic domain boundaries. Bending or mechanical shock after annealing may disrupt the material's grain alignment, leading to a drop in the permeability of the affected areas, which can be restored by repeating the hydrogen annealing step. Mu-metal is a soft magnetic alloy with exceptionally high magnetic permeability. The high permeability of mu-metal provides a low reluctance path for magnetic flux, leading to its use in magnetic shields against static or slowly varying magnetic fields. Magnetic shielding made with high-permeability alloys like mu-metal works not by blocking magnetic fields but by providing a path for the magnetic field lines around the shielded area. Thus, the best shape for shields is a closed container surrounding the shielded space. The effectiveness of mu-metal shielding decreases with the alloy's permeability, which drops off at both low field strengths and, due to saturation, at high field strengths. Thus, mu-metal shields are often made of several enclosures one inside the other, each of which successively reduces the field inside it. Because mu-metal saturates at such low fields, sometimes the outer layer in such multilayer shields is made of ordinary steel. Its higher saturation value allows it to handle stronger magnetic fields, reducing them to a lower level that can be shielded effectively by the inner mu-metal layers. RF magnetic fields above about 100 kHz can be shielded by Faraday shields: ordinary conductive metal sheets or screens which are used to shield against electric fields. Superconducting materials can also expel magnetic fields by the Meissner effect, but require cryogenic temperatures. The alloy has a low coercivity, near zero magnetostriction, and significant anisotropic magnetoresistance. The low magnetostriction is critical for industrial applications, where variable stresses in thin films would otherwise cause a ruinously large variation in magnetic properties. 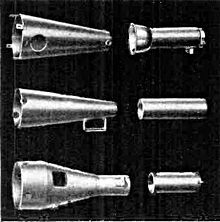 Mu-metal was developed by British scientists Willoughby S. Smith and Henry J. Garnett and patented in 1923 for inductive loading of submarine telegraph cables by The Telegraph Construction and Maintenance Co. Ltd. (now Telcon Metals Ltd.), a British firm that built the Atlantic undersea telegraph cables. The conductive seawater surrounding an undersea cable added a significant capacitance to the cable, causing distortion of the signal, which limited the bandwidth and slowed signaling speed to 10–12 words per minute. The bandwidth could be increased by adding inductance to compensate. This was first done by wrapping the conductors with a helical wrapping of metal tape or wire of high magnetic permeability, which confined the magnetic field. Telcon invented mu-metal to compete with permalloy, the first high-permeability alloy used for cable compensation, whose patent rights were held by competitor Western Electric. Mu-metal was developed by adding copper to permalloy to improve ductility. 50 miles (80 km) of fine mu-metal wire were needed for each mile of cable, creating a great demand for the alloy. The first year of production Telcon was making 30 tons per week. 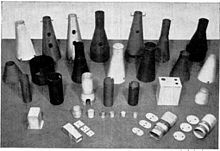 In the 1930s this use for mu-metal declined, but by World War II many other uses were found in the electronics industry (particularly shielding for transformers and cathode ray tubes), as well as the fuzes inside magnetic mines. Telcon Metals Ltd. abandoned the trademark "MUMETAL" in 1985. The last listed owner of the mark "MUMETAL" is Magnetic Shield Corporation, Illinois. Electric power transformers, which are built with mu-metal shells to prevent them from affecting nearby circuitry. Hard disks, which have mu-metal backings to the magnets found in the drive to keep the magnetic field away from the disk. Cathode-ray tubes used in analogue oscilloscopes, which have mu-metal shields to prevent stray magnetic fields from deflecting the electron beam. Magnetic phonograph cartridges, which have a mu-metal case to reduce interference when LPs are played back. Magnetic resonance imaging (MRI) equipment. The magnetometers used in magnetoencephalography and magnetocardiography. 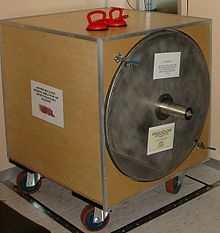 Vacuum chambers for experiments with low-energy electrons, for example, photoelectron spectroscopy. Superconducting circuits and especially Josephson junction circuits. Fluxgate magnetometers and compasses as part of the sensor. Other materials with similar magnetic properties include Co-Netic, supermalloy, supermumetal, nilomag, sanbold, molybdenum permalloy, Sendust, M-1040, Hipernom, HyMu-80 and Amumetal. In recent times pyrolytic graphite (also incidentally used in some OLED panels as a heat sink) has been used as it also shows useful magnetic field exclusion properties. ^ a b c Jiles, David (1998). Introduction to Magnetism and Magnetic Materials. CRC Press. p. 354. ISBN 978-0-412-79860-3. ^ Weast, Robert (1983). Handbook of Chemistry and Physics (64th ed.). CRC Press. p. E-108. ISBN 978-0-8493-0464-4. ^ "MuMetal Home". mu-metal.com. Josh Wickler. Retrieved 2015-07-06. ^ "Mu Metal specifications". Shielding Specifications. Nick Murby. 2009-03-25. Retrieved 2013-01-21. ^ "Magnetic Fields and Shields". FAQ. Magnetic Shield Corp. Retrieved 2008-12-14. ^ Green, Allen (2004). "150 Years Of Industry & Enterprise At Enderby's Wharf". History of the Atlantic Cable and Undersea Communications. FTL Design. Retrieved 2008-12-14. ^ "Trademark Status & Document Retrieval". tsdr.uspto.gov. Retrieved 2017-07-28.